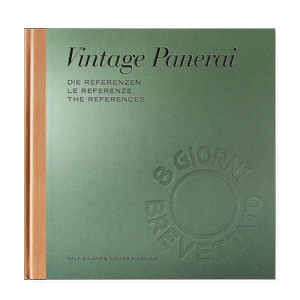 The second volume of “The References” continues to document, with numerous images and historic information, 37 Vintage Panerai watches from the 1950’s to 1960’s. The References 6152 and 6154, followed by the famous 6152/1 with the famous crown-protecting device are explained in detail and many variations. Followed by the Reference GPF 2/56 with Angelus movement, this book features also the Modified References 3646, Transitional 3646 and Modified Reference 6152/1. Compasses and depth gauges, followed by an overview of the straps and buckles used on Vintage Panerai of this era. 26 x 26 cm, 696 pages, trilingual (German, Italian and English language in one book), 27 database charts, 353 illustrations, including rare historic photos from Italian and Egyptian frogmen, hardback jacket, slipcase.